To mark the 150th anniversary of the birth of Nielsen, LSO Live has reissued its recordings of the six symphonies. Now they are paired in compositional order, two to a disc, but when they were first issued the symphonies were grouped differently. Symphonies Four and Five were issued together, followed by numbers One and Six and, finally numbers Two and Three. My colleague, Jack Lawson covered all three issues in one review. In addition, there’s now a BD-A disc that contains all six symphonies. I may as well deal with the dual-format audio question first. I listened both to the first three symphonies on SACD and the BD-A, using the 2.0 LPCM option on the BD-A, and in both cases I used a Marantz Ud7007 player. The results I obtained weren’t significantly different. There’s a bit more presence and definition on the BD-A, but the SACD sound is just as punchy. I listened to the last three symphonies as a conventional CD on a Roksan player and again got very good results. Since LSO Live generously offer both the SACD and BD-A options it’s good to have them alongside each other in the same package. The recordings themselves are, as I said, punchy. I was more conscious of the closeness of Barbican sound than I have been with previous releases from this source. The sound isn’t claustrophobic by any means but it is fairly close: you have the impression of being in a front stalls seat. The results are not dissimilar to the Dacapo recordings of Alan Gilbert and the NYPO in the same repertoire (review ~ review ~ review), Some may find the sound given to either Davis or Gilbert a bit too up-front by comparison with, say, the BIS sound on Osmo Vänskä’s recordings made between 1999 and 2002, though I’ve only heard those in conventional CD format; I rather like the more natural sound on those recordings (review). However, the LSO Live recording and the playing of the orchestra means that these Davis recordings, without being in any way flashy have plenty of impact and I appreciated this together with the excellent level of detail that’s readily audible. As far as I’m aware Sir Colin came late to Nielsen’s music, which is mildly surprising given that he was a noted Sibelius interpreter for decades. I believe the Nielsen symphonies only came into his repertoire in the last few years of his life. Not that one would know that these performances were the work of a man who was in his mid-eighties when the first of them was given. The accounts of all six symphonies are full of freshness and, above all, energy, the latter being an essential prerequisite for successful Nielsen performances. Symphony No 1 gets the set off to a spirited start. Nielsen made a very confident beginning to his career as a symphonist and Davis and the LSO capture the spirit very well. The first movement has a good mix of blazing energy and gentle lyricism here. The second movement is primarily songful but Davis invests the climax with passion. The Allegro comodo start of the third movement has a nice easy swing to it although soon that gives way to music that has more vitality. The finale is characterised by drive and extrovert energy; Davis achieves an exuberant end. One of the two concerts from which this recording was taken was review for MusicWeb International Seen and Heard by Mark Berry. The recording of the Second Symphony is just as successful. Furious energy is the main characteristic of the opening movement. It’s well achieved here and the recorded sound accentuates that. By contrast the second movement is mainly about the LSO’s collective delicacy and finesse. The orchestra – and the strings especially – give an eloquent account of the deeply-felt third movement; Davis leads a powerful reading. Nielsen said of the finale that he “tried to sketch a man who storms thoughtlessly forward in the belief that the whole world belongs to him.” I wouldn’t accuse Sir Colin of such a lack of self-awareness but there’s no lack of confidence, even swagger, about much of this movement in his hands though the more reflective episode for the strings mid-way through is sensitively handled. Davis opens the Espansiva strongly, incisive timpani propelling the music forward. During the course of the first movement the dynamic contrasts between the various passages are excellently observed. This is life-enhancing music with vitality coursing through its veins and a good deal of that comes through here. I’m less happy with the slow movement, which is taken quite briskly. To give you an idea, Davis takes 7:26 whereas Vänskä and Gilbert clock in within a second of each other – the former takes 9:11. It seems to me that Davis misses some of the poetry and sense of relaxation as a result. The two soloists are good. Incidentally, reviewing one of the concerts for MusicWeb International Seen and Heard, Colin Clarke observed that it wasn’t always easy to hear Lucy Hall but with the microphone to help that’s not an issue on the recording. The following movement is essentially relaxed and here I think Davis does get the pacing right. He leads a stirring account of the finale, the big tune bold and forthright. The Fourth Symphony erupts into life, as it should. The quieter passages in the first movement still maintain the tension but it’s the boiling energy and sheer propulsion of the performance that leave the strongest impression. This is another case where the quality of the sound accentuates the impact of the performance. When I first received the set this was the first disc that I sampled; it impressed me then and has continued so to do. The LSO winds play with pleasing delicacy in the second movement but that’s the lull before the storm. That storm arrives with the intense playing of the strings and timpani at the start of the third movement. This is another movement in which Davis sets a tempo that’s rather quicker than several other conductors I’ve heard. Both Gilbert and Vänskä, for instance, take over 10 minutes for the movement whereas Sir Colin gets through it in 8:36. But maybe his tempo selection is justified because the marking is Poco adagio quasi andante, suggesting, perhaps, that Nielsen didn’t envisage a long-breathed slow movement. Despite adopting a tempo that is a bit more flowing than usual Davis’s reading has great power. The finale is, for the most part, dynamic and turbulent. The duel of the timpani (Nigel Thomas and Sam Walton) is very potent, the sound of the drums thrillingly present in the recording. The LSO gives a tremendous account of this finale, ending with the triumph of the indomitable – and inextinguishable – human spirit, even if other conductors have brought just a bit more breadth and grandeur to the closing pages – though Davis’s maintained urgency here is a valid solution. The Fifth begins with the necessary sense of unquiet calm but soon the tension begins to build. The menace of the march that begins shortly after the first entry of the side drum is enhanced by the boldness of the recording. I savoured the wildness of Andrew Marriner’s clarinet playing at 5:25. What struck me during these early pages – and it continues to be a factor throughout the symphony – is the weight of the sound of the LSO’s cellos and basses. On numerous occasions details in the string bass line came out that I’d not previously registered. This, I’m sure, is the work of Davis rather than the microphones and I like it. The first half of the movement is strongly profiled in this reading. The Adagio is separately tracked. At the start the LSO strings are eloquent and warm. In the first few minutes of this section Davis invests the music with a Sibelian grandeur, which reminds us of his expertise in the music of the Finnish master. Then, around the five-minute mark, the storm clouds begin to gather and soon that disruptive side drum is with us again. The drummer is, I suspect, Neil Percy, the LSO’s principal percussionist; his is not the most cataclysmic contribution I’ve heard in this symphony but it’s pretty potent. When the climax is attained the LSO’s brass sound majestic. As the tumult subsides and the music unwinds Andrew Marriner’s clarinet is highly expressive. The music really pulses with life at the start of the second movement and, as with some other performances in this cycle, Davis frequently keeps the energy quotient high. The fugal episodes are unfolded in a very clear and controlled fashion. In the last three minutes or so the frenetic energy levels are attained again and the conclusion of the work is gripping. I freely confess that I am not the most reliable of guides to the Sixth Symphony. I’ve tried many times with the work but it remains music to which I don’t warm and with which I find it hard to connect. The opening of the first movement is innocent on the surface but the listener is aware that just below the surface calm there are troubled waters – and thoughts. That comes across in Davis’s reading. It’s a difficult movement to put across but the playing is accomplished and characterful; the woodwind contribution is especially acute. Davis and his players ensure that detail is clearly articulated. At times in this movement there’s real turbulence while in other passages Nielsen demands great finesse from the musicians: all of this the LSO delivers. The odd, quirky Humoreske is despatched with relish by the LSO woodwind, brass and percussion, the playing neatly pointed. The trombone interjections (Dudley Bright, I presume) should sound like the musical equivalent of someone sticking out their tongue provocatively or rudely and that’s definitely achieved here. The strings take centre stage for much of the slow movement and here do so with distinction. The finale seems to me to explore a similar vein of sardonic humour as that which we later came to associate with Shostakovich. There’s also a hint of Ivesian gaucherie (5:47 – 6:13). Davis and the LSO deliver a lively and acute performance which I can admire, even if I don’t love the music. Gavin Dixon reviewed this performance in concert for MusicWeb International Seen and Heard. There are several Nielsen symphony cycles on the market and, doubtless, some more recordings will come along in 2015. Blomstedt and Vänskä, among others, have their admirers, and rightly so. There’s also the evolving Oramo series, which I’ve not yet heard and the Alan Gilbert cycle, previously mentioned. I think that on balance Davis is more consistent than Gilbert. This LSO cycle contains no disappointments and I think it’s a solid, very reliable choice. If that sounds like I’m damning it with faint praise that’s most certainly not the intention; these are thoroughly considered and convincing interpretations. Throughout the performances the virtuoso playing of the LSO is a decided asset. The inclusion of a BD-A option adds to the attractiveness of the set. There are good booklet notes by Stephen Johnson. I suspect that these were written for the individual concerts as they took place and that will explain a modest amount of repetition but, as usual, Johnson is a sure guide to the music about which he writes. Reader may like to know that each of the concerts at which these symphonies were performed also included a Haydn symphony. Those recordings have been gathered into a most rewarding two-disc set by LSO Live (review). 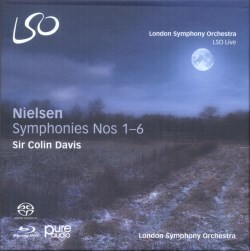 Sir Colin Davis was always worth hearing, especially during his partnership with the LSO. This set is a desirable package and its appearance in this format is a very good way of marking the Nielsen 150th anniversary.